With more people than ever looking to travel, the camping and RV industries have scrambled to provide lightweight options that can be hauled without the need for a heavy-duty truck. These trailers are perfect for families who are would like to get into RV lifestyle without having to spend a fortune on gasoline, or an up-size truck. Travel trailers in the range from 2,000lbs to 3,000lbs represent a mid-range solution for nature lowers. They are large enough to offer enough of living space and home-like comfort. But they are also sufficiently lite to be pulled by popular SUVs, Minivans and larger sedans. On this page, we cover our picks for the best lightweight travel trailers weighing under 3,000 pounds. The 15' Travel Lite Cobblestone weights only 2,500 and has a range of high-end features. These include 19-inch flat screen televisions with DVD players, cherry cabinets and a full kitchen including refrigerator, stove, and built-in microwave. The high-quality wood and other materials give this affordable lightweight travel trailer the feel of a far more expensive RV. This one you may just want to see in details! 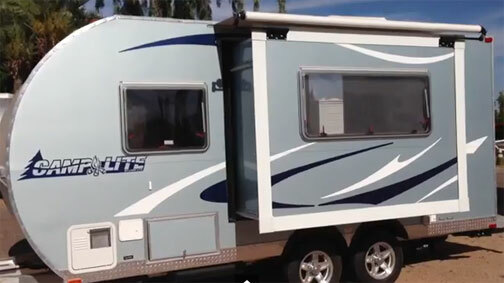 The Starcraft Launch travel trailers are available in lengths of 15, 16, 17 and 18 feet. They are so called "hybrid" trailers which means an extra sleeping place is achieved thanks to side-tent(s). 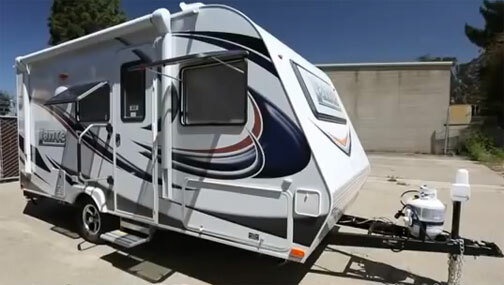 All trailers are less than 3,000 pounds and offer a range of amenities. A two-burner range, 8,000 BTU side-mounted A/C unit, tub/shower combo, and inside/outside dinette are all standard for these lightweight travel trailers. Despite their size these trailers are designed so lightweight that even a minivan could tow them. 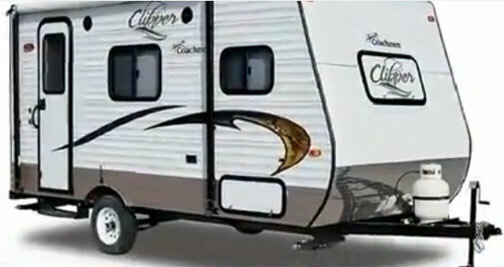 Coachmen Clipper: It is bigger than it looks because it is a hybrid trailer with popping-out side tents. The Clipper Ultra-Lite 15RB can sleep 4 thanks to the slide-out double bed. The private toilet and tub/shower combination is something you'd expect from a far larger RV, while the galley kitchen is pretty standard, featuring a two-burner range and sink. In the front of the trailer is a booth dinette that has extra storage beneath the seats. If you need additional sleeping space, you can add an optional tent-end-bed in the front as well. This model weighs only 2,553 pounds. The Lance 1575 offers a lot of room for such a lightweight travel trailer. Weighing only 2,575 pounds, you wouldn't expect to see such a large living space. Lance accomplishes this with lightweight construction materials they call Lite-Ply. This model features a dry bath and comfortable sleeping for four adults. Other features include Satellite HDTV dish, solar power, tent option, RV stereo with iPod compatibility and LED exterior lighting. The skylight and large windows make this small travel trailer feel much larger than it is. 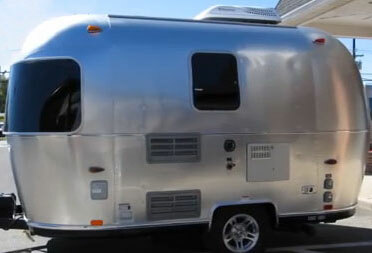 Airstream Sport travel trailer: the panoramic front window makes big change to the otherwise retro design. The Airstream Sport is a gorgeous 16' travel trailer that weights only 2,900 pounds, allowing it to be towed by most smaller pickup trucks and SUVs. 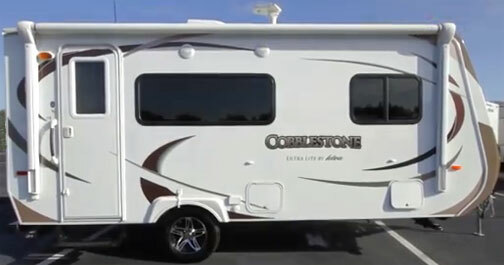 This model features a rear bed and wet bathroom, but it also has an optional configuration of a front bed and full rear bathroom. The front panoramic windows let in plenty of light, giving the illusion of more space. The iconic Airstream look makes this travel trailer an eye-catcher wherever you go. 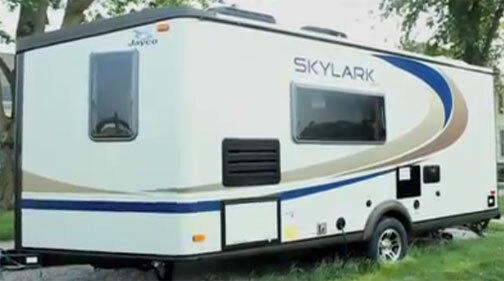 The Jayco Skylark 21FVB weighs 2,955 pounds but has a number of included and optional features you'd expect from a larger RV. Privacy shades in every window, hidden cabinetry hinges, stainless steel sink and cooktop, diamond floor vinyl flooring, and aluminum framed furniture are all standard on this lightweight travel trailer. Additional options include larger refrigerator, convection microwave, water purifier, and electric patio awning. The Camplite 16DBS weighs 2,995 pounds, barely making our list. Still, with a queen bed, optional dinette bed, and optional fold-down bunk, we couldn't leave this travel trailer out. The galley features a two-burner stove, refrigerator, and sink, while the bathroom includes an interior shower. One of the best parts about this lightweight travel trailer is that 98% of its materials are recyclable. It’s making it one of the most environmentally friendly RVs you can find on the market today.